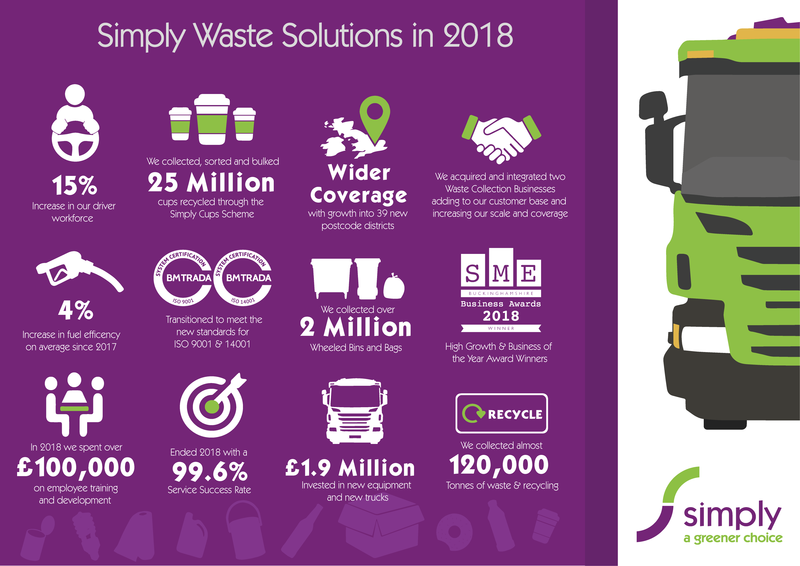 Simply Waste Solutions has continued its growth throughout last year and finished it on a high. The largest increase in customers in 2018 came from the acquisition and integration of two trade waste divisions. The first at the beginning of February saw our coverage area grow into the Oxfordshire area with the acquisition of an Oxfordshire company’s wheeled bin waste collections. This was shortly followed by buying the waste management division of a London-based waste company. This deal increased our customer base by over 500 customers, making us one of the largest independently-owned waste management companies operating in the capital. With these acquisitions and organic growth, we added 39 new postcode districts to our service area in 2018. This new growth has meant that we’ve needed to increase our driver workforce by 15% to collect nearly 120,000 tonnes of waste and recycling from over 2 million wheelie bins and waste bags. We invested over £2 million in employee training and development as well as new trucks and equipment. On top of this, we’ve helped to collect, sort and bulk the 25 million cups that have been recycled through the Simply Cups scheme. 2018 has been another fantastic year and we’re all excited to see what 2019 will bring.